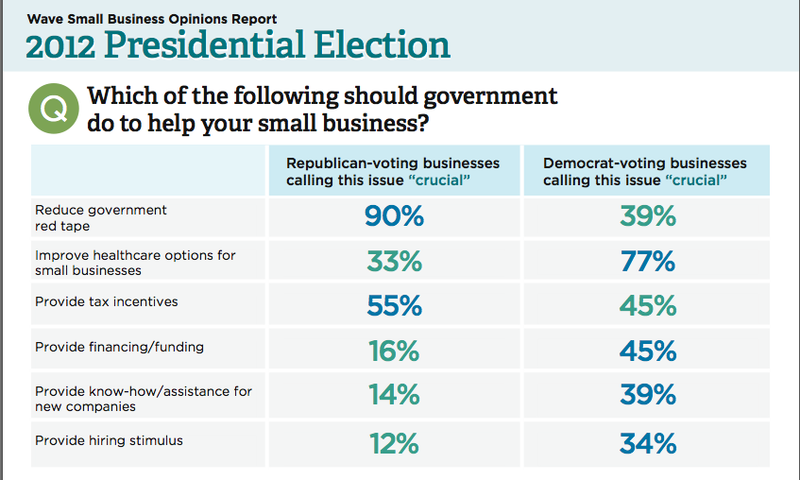 Small Business Poll: Obama Closing Romney Lead? It's not a huge surprise that a majority of small business owners favor Republican candidate Mitt Romney in this November's election. What's more surprising is how many now say they plan to vote for President Obama. In a new poll from Wave Accounting--which provides free accounting and payroll software to small business--45% of small business owners said they were "definitely" voting for Romney, while 32% said they would "definitely" vote for Obama, according to a data analysis provided exclusively to Inc. If you include the probable voters, the breakdown is 52% Romney/37% Obama. The new poll--for which Wave surveyed more than 1,000 small business owners as well as employees at firms with 10 or fewer employees--also dug into the issues that small business owners and employees say are the most important. More than two-thirds of the respondents said that reducing regulations and rules should be the government’s top priority in helping small businesses. Surprisingly, this is the opposite of a recent Inc. 500 survey, in which small business owners said that federal red tape was the least of their concerns. Perhaps one clue is the political divide: In the Wave survey, regulations were a crucial concern for 90% of all Republicans surveyed, but only 39% of Democrats felt the same way. By contrast, Democrats' top priority was improving the health care options for their employees. The Wave poll offered this breakdown by party of small business owners' and employees’ top priorities.